October was a very busy month. With two major trips planned including one from my bucket list, I was hard pressed to find a quiet moment to write about my exploits. The last time I was in Chicago was around 7 to 8 years ago. It was some time in the spring. I did quite a bit of photography on that trip with my original 7D. I had just started figuring out what my Chasing Sunsets series would look like. Unfortunately as my workflow and archival processes evolved in their infancy, I lost the RAW image files. As a matter of fact, I am unable to locate photos from that trip. Needless to say, I was extremely frustrated when a major magazine catalogue contacted me asking for high quality skyline and cityscape prints of iconic American cities, especially Chicago. Low cloud cover over Chicago. Since then I have been meaning to get back out to Chicago just to photograph it at Sunset for my limited edition collection. Early October presented my only opportunity to accomplish this before winter and the end of the year. I searched extensively for a hotel, apartment, condo, and property with a decent view of the skyline. My main plan was to capture the city from the Observatory which extends out into the lake and offers a clear unobstructed panoramic view of the city. 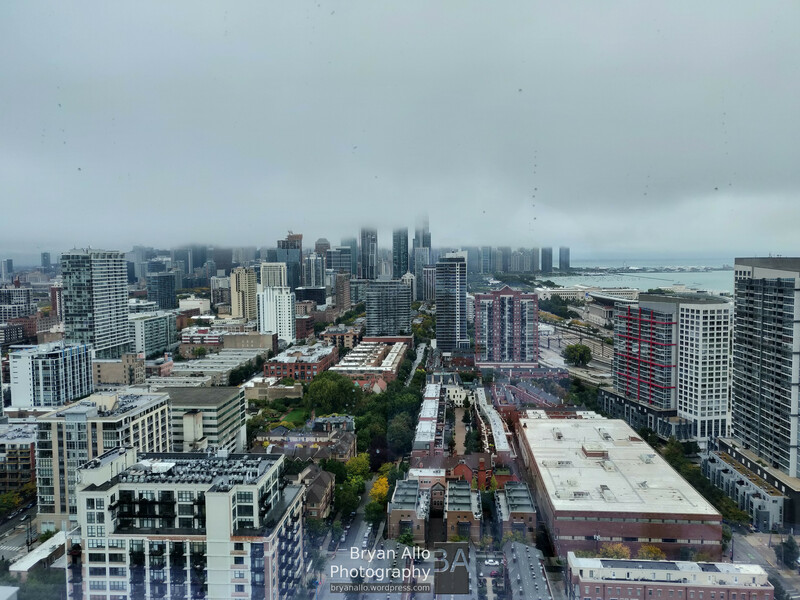 However as always with the weather in Chicago, it was severely overcast all day Saturday, my only full day in Chicago for this trip. This was especially frustrating. I was prepared to weather the rain for my shot but the low cloud deck covered half of the skyline all day. Waiting and hoping for the rain and clouds to reveal the Chicago. 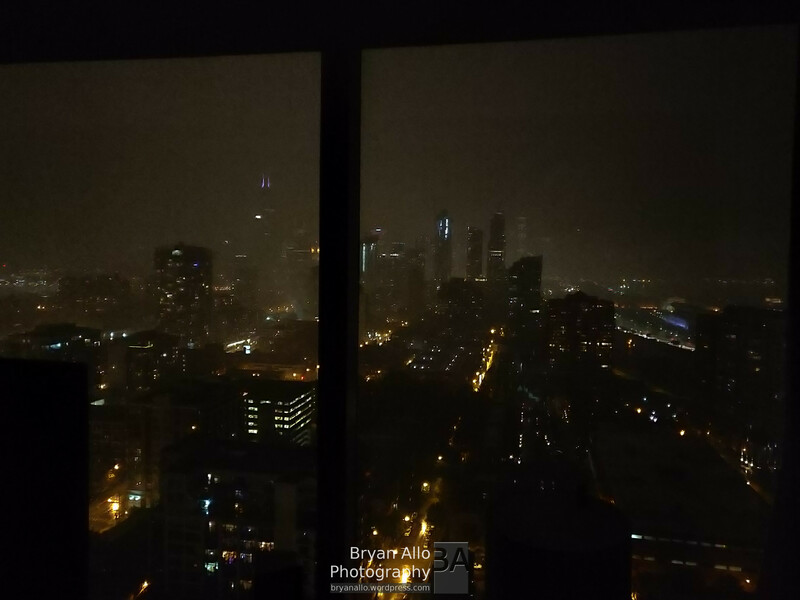 So after exploring he city up close via the CTA metro system, I resigned to my hotel room and hoped the cloud deck would lift just enough to clear the sears tower around sunset so I can get my shot of the skyline. Finally just before the sun set, Chicago revealed herself. 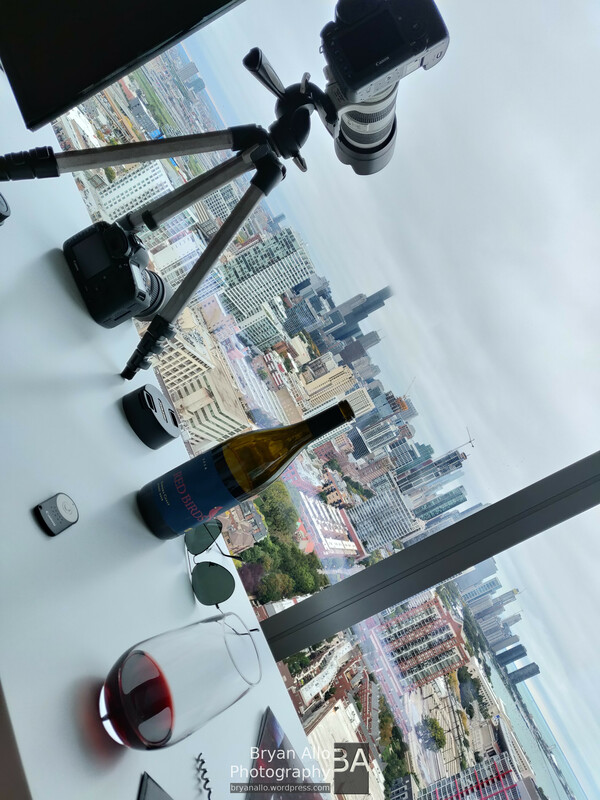 At this point I had already had a couple glasses of wine to calm my nerves and ease my frustrations at the prospect of making the trip to Chicago from Sacramento and still not being able to capture the skyline. The hotel room offered unobstructed views through glass walls floor-to-ceiling. It was the perfect backup scenario. I immediately went to work, sorting through the various obstacles and challenges, such as water droplets on the hotel room window, ghosting, reflections and distortions. I shot primarily with the Canon 5DsR and EF 70-200mm f/2.8L IS II lens. My trusty Manfrotto travel tripod handled the task with ease. All’s well that ends well. I shot through the sunset keeping the room as dark as possible to avoid reflections. I tracked down every light source inside the room and masked it with dark socks, towels, scarves, and garments. You’d be surprised just how many point light sources you can find in a dark hotel room. My view upon arrival. Terrible weather. I wanted to post a little about the prints that we selected for the SMUD Exhibit: Through the Lens as part of the first inaugural annual photography month in Sacramento. I went back through my archives to find out when I took this shot and realized it’s been over 4 years ago. It was shortly after I visited Folsom Lake. California was approaching the height of a long drought. As a result the Folsom lake level was so low, it exposed an old gold mining camp/settlement that was otherwise buried under over a hundred feet of water. It was a profound experience walking among the old settlement from the gold rush days. It was also alarming as it underscored the dire situation Californians were facing. I posted about that excursion here: The California Drought – Folsom Lake. As I walked the lake bed, it suddenly occurred to me that the river by Old Sacramento must have been at it’s lowest level in a very long time. The next thought that came to mind was that the low levels on the river would make for calmer waters and receded banks. This meant that I would be able to get a more dramatic shot at sunset. I was pretty much right on the money. The levels were so low no boats or water crafts didn’t dare disturb the water. It was as beautiful as it was spooky. I also captured a time lapse of the sunset in which you could see this thin ghost-like wispy clouds creeping up the river. 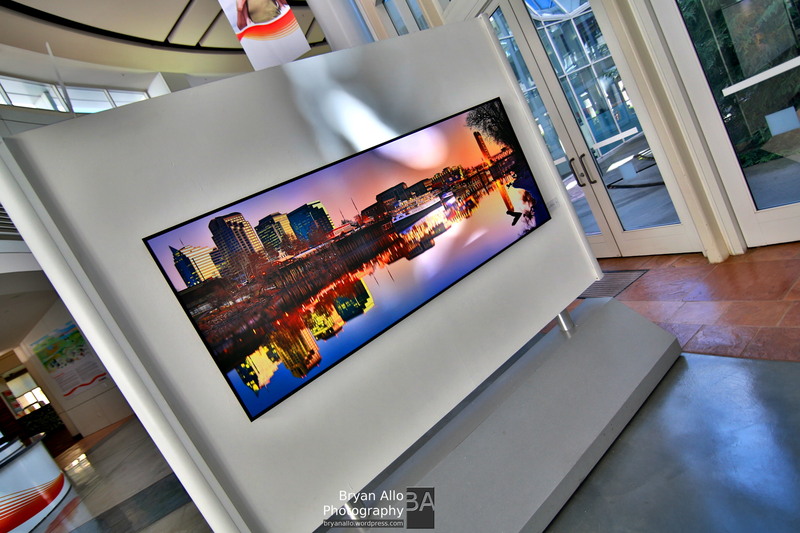 This image took 60 shots – 20 frames (two rows of 10 HDR) each consisting of 3 brackets. I shot it with the Canon 5D Mark III and the 70-200mm f/2.8 IS II at 200mm. Composing, stitching and editing this shot took weeks as I would frequently exceed the limits of editing software and memory. Single layers were easily over 1.5GB in size had to be committed to separate files. Opening one layer quickly used up 8-10GB of system RAM, often resulting in data corruption. Producing this shot was a veritable test of patience, well worth the time and aggravation. This shot like much of my photography is only available in a very limited edition of 10 signed and numbered copies. At the time of this post, only 4 copies remain in the edition. This is a large format print, while it is available in custom sizes, the smallest recommended size is 6.5 feet in length. It can be printed to the scale of a mural without any compromise in fine detail. You can make out wine glasses hanging over the bar inside the Delta King as well as every nut and bolt on the Tower Bridge. You can also make out art hanging on the walls in the office buildings. I am actively looking for opportunities to place at least one of the limited copies as a large format art installation. It’s been a really busy year. Unfortunately the first thing to take a hit has been my blog posting. I have not been able post as consistently as previously. However I’m happy to say my photography has not taken a hit. I have pretty much dedicated whatever free time I can find to actually doing photography and traveling whenever I can. This means it’s just a matter of catching up and sharing. If you follow me on Instagram (@bryanallo), you will catch more frequent glimpses of my photographic exploits. I recently returned from a trip to Vancouver via Seattle a little over a week ago. It dawned on me that I had visited Seattle about a year ago as well. I did a lot of Photography but never got around to posting about that trip. I suppose the main reason was I never got around to composing the large panoramic shots I had painstakingly captured. This one was captured just after Sunset, from Duwamish Head at Luna Park, in the Alki Beach area. I scouted this shot all afternoon with my brother who had just moved to Seattle at the time. After scouting the shot, we walked to the burger joint down the street for a late lunch. We returned to Luna Park and camped out there through the sunset. Fortunately Seattle revealed herself. It was quite windy though. This was only compounded by the long 400mm focal length required to get a good framing. My first choice location was Hamilton ViewPoint Park but alas there was what looked like an Ore Ship painstakingly offloading it’s cargo all weekend long right in the middle of my shot. So I went with plan B which did not disappoint at all. I shot this with the 50 MegaPixel Canon 5DsR and the EF 100-400mm L IS II. I’m not sure I could have done it otherwise. The resulting panorama is half a GigaPixel with boat loads of detail and color. I am very much looking forward to taking this to Limited Edition print. Only 10 signed numbered copies will every be made. Have you ever visited Seattle? What was your favorite view on the city? Last weekend I took a quick trip down to LA for the weekend to vacation with family for the Memorial Day weekend. It was a nice escape. My brother picked out a villa in the Hollywood Hills for us to stay. One of the nice things about this particular home was the unobstructed view of the Downtown LA Skyline. Perched at the top of the hill, with three levels and a rooftop terrace, it was only too easy. After everyone had finally retired for the night, I grabbed my camera and stepped out into the cool evening breeze. The LA smog was a bit of a challenge but nothing too challenging. I have captured the city from various other vantage points you can read more about here. I traveled light for this trip. I brought just my go-to-in-a-pinch camera, the Canon 7D Mark II and Canon EF-S 17-55mm. Fortunately my brother also has the same setup but he also brought his Canon EF 100-400mm L II lens. Without it, this shot wouldn’t have been possible. This panoramic was taken at 400mm. The hills are quite far from Downtown LA. This is a rough draft of the panorama. I’m undecided if this shot should make it to limited edition print. If it does, it will require some editing. Do you have any favorite angles on the city to share? Thanks for stopping by. This was the location from which I should have shot the fireworks the previous night. I posted about it here: New Year’s Eve in Miami. This was my backup shot but got overlooked because I felt the distribution of buildings in the skyline was uneven. As it tuned out this was one of the most beautiful sunset shots I’ve taken yet. Miami is so wild and unpredictable. That makes for fleeting but frequent beauty. You just need a little patience and a very keen eye. I love how Miami somehow always managed to show purple hues. If Purple isn’t the official color of Miami, it most certainly should be. What a gorgeous city full of gorgeous people! I shot this with the 50.6 Megapixel Canon 5DsR and EF 70-200mm f/2.8L IS II lens. The final panorama has tons of detail that may never be fully appreciated. You can see some of the detail in the 100% crop on the right. This shot will be available in limited edition fine art canvas print but I may reserve half of the edition for large art and commercial installations. 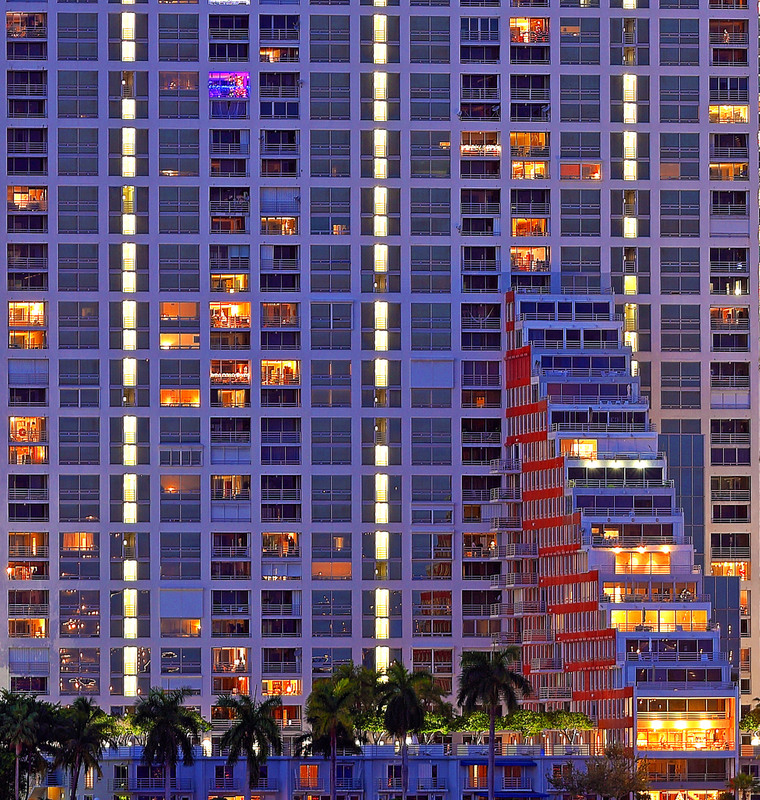 Have you visited or photographed Miami? What were your favorite perspectives on this crazy, wild city? Well this is how my year started off – chasing the sunset. I had a unique opportunity to make the trip to Miami, Florida for the new year. So I jumped on the last flight I could across the country to Miami. I did miss the sunset however. So I proceeded to plan B. As with most destinations I travel to, I began studying the local maps and topology. Because of the limited time and long journey, I put extra emphasis on my research. I settled on a harbor area on the keys just across from the front face of the Miami skyline. I liked the relatively unobstructed view. After checking with local staff at the venue and confirming it was okay for me to setup my camera equipment, I went to work. This perhaps wasn’t the best location to photograph the fireworks. As it turned out, the Miami International Airport departure route flies right above the center of the skyline. This meant that the fireworks will not be anywhere close to the center of the frame as I hoped. I only realized this hours into my shoot and could not move as I was already hours into a time lapse sequence that was to last most of the night through the fireworks. Bummer! I suppose I need to factor air traffic into my research. All that aside, it turned out to be a very productive shoot. 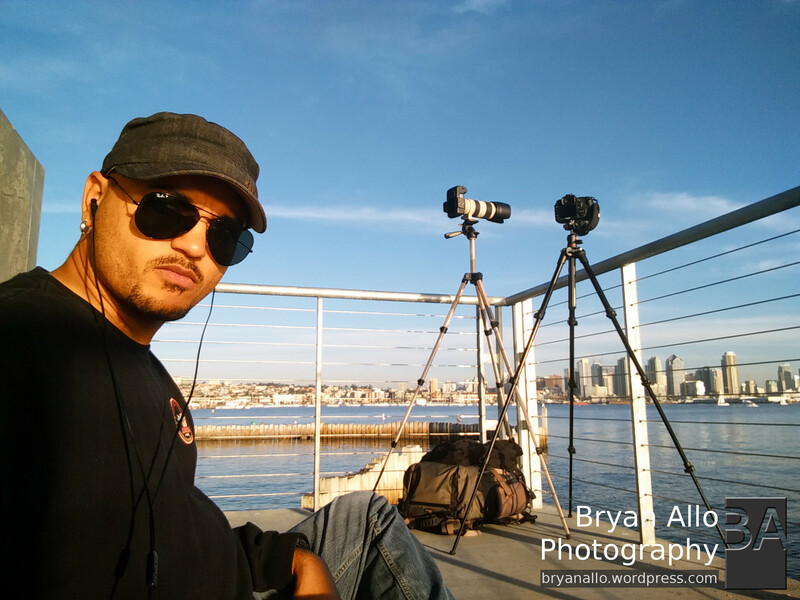 I shot a time lapse with the Canon 7D Mark II and 17-55mm f/2.8 lens. This is now standard practice most of the time. While that was going, I started taking frames for a very detailed ultra high resolution panoramic of the skyline and waterfront with the 50 megapixel Canon 5DsR and EF 70-200mm f/2.8L IS II lens. The final result is breathtaking. It is at least three times wider than the shot above, and you can count Christmas tree ornaments on the trees in the apartments. As it turned out my first pass ended up being my shot of choice. The 5DsR is the perfect camera for this sort of photography. This shot made it to my collection of limited edition large format prints and I cannot wait to print and share the first one! Earlier this year Canon announced ultra high resolution variants of their 5D series DSLR camera, the 50.6 Megapixel 5DS and 5DS R. I will not attempt to rehash details and specifications which at this point have already been discussed ad nauseam. If you are not yet familiar with this camera I highly recommend Bryan Carnathan’s extensive in-depth review. I will be providing you with my perspective on the camera as an active photographer, what it’s like to use the 5DS R out in the field on a daily basis. Hopefully I can help you determine if this is the right camera for you. 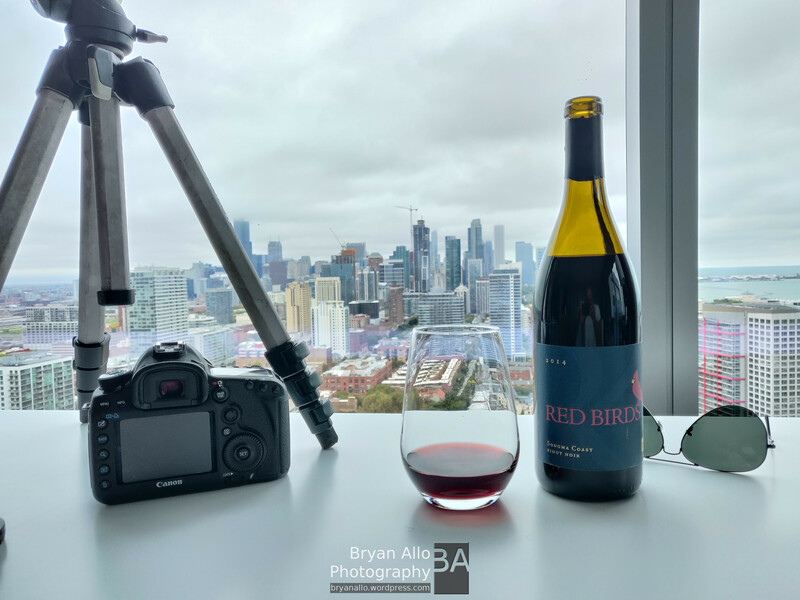 One of the things I have really come to appreciate about pursuing my passion for photography around the Canon Pro camera system is their overarching philosophy. Nowhere else does a dedication to real and active photographers show more. I recall tweeting frustrations about missing features in Canon Digital Photo Professional (DPP) a few years ago and they quietly made it into a subsequent release. I’m not suggesting that I was the reason but I am sure I wasn’t the only one. They listened. I am convinced there is an active and deliberate effort at Canon to put the photographer at the forefront of every decision. It shows even more with the 5DS and 5DS R. This camera is not a trendy gadget or toy. It is not intended to give gear heads Megapixel bragging rights. It is a distillation of everything Canon has determined to be of importance to real and active photographers. A lot of thought has gone into the fundamentals critical to good and effective photography and it shows. The 5DS R fills less of a traditional DSLR role, where you are typically on the move and shooting in dynamic situations. It is more of a compact and portable Medium Format body that just happens to work with your existing Canon camera system. This is perhaps it’s biggest value proposition. A year ago I was seriously considering investing in a Medium Format system, however I was not looking forward to maintaining two separate lens systems. One of my frustrations with the 5D Mark III was the low pixel density of the sensor, it just wasn’t well suited when shooting high resolution still life and panoramas for my limited edition prints while traveling. So I very often packed my 7D Mark II for this. However this meant more work in post processing and stitching. I also thought it was a shame to waste most of the image and sharpness of the amazing EF 70-200mm f/2.8L IS II lens with the lower pixel density of the 5D Mark III sensor. I often found myself wishing for a full frame sensor with a pixel density closer to the 7D Mark II. This is exactly what canon has delivered!!! Thank you Canon! Here are a few frames from my shots of San Diego a few weeks ago along with 100% crop close-ups. Images were rendered in-camera and unedited. Unless you’ve honed your shooting/breathing/heart-beating technique on a high pixel density body such as the 7D Mark II, you will find the 5DS R very challenging for hand held or walk around photography. Like the 7D Mark II, it is very unforgiving when it comes to camera shake. Due to the sensor being much bigger motion/shake will be even more pronounced towards the edges of the frame where axial rotational vibration is more pronounced and image stabilization can only do so much about it. You can see this in the shots of the Christmass tree. Still, this shot would not be this sharp without the shutter delay, another well thought out feature. Whenever you pack the 5DS R, you should always pack a sturdy tripod to get a as close as possible to 50.6 Megapixels of detail. Below are a few handheld shots while walking around downtown, exploring fall colors. I have also included 100% crops since the images would otherwise be too large. These two have more in common than you think. Before you consider adding this megapixel monster to your kit, make sure the lenses in your kit are capable to resolving details as close to the sensor resolution as possible. I highly recommend updated Canon EF L-Series lenses of the Mark II revision. No. That EF 24-105mm f/4L lens that was tack sharp on your 5D Mark II/III will not resolve anywhere near enough detail for the 5DS R. This is a common problem some have with the 7D Mark II because they don’t realize it has over twice the pixel density of the typical full frame body and thus the lens must be twice as sharp as on a full frame body. Without proper optics, megapixels are merely wasted. Thankfully Canon realized this several years ago and began revising their top lenses in preparation for ultra high resolution photography. The EF 70-200mmf/2.8L IS II lens has an effective resolution very close to the 50 Megapixels from center to edge or frame. The EF 300mm f/2.8 IS II lens most definitely out-resolves the 5DS R sensor from center to edge of frame. What an amazing lens!!! Well done Canon! As I’ve said before and most recently in my post Canon 7D Mark II – First Impressions , anyone using high ISO noise performance as a benchmark is obviously not into or does not practice enough photography. All sensors generate noise at higher ISO but most importantly have a significant loss in dynamic range. What is most critical is how a sensor performs between ISO-100 and ISO-800. This is my cap for any photography that I plan on taking to print or publishing. Beyond ISO-800 there is more noise than I am willing to put up with (regardless of the camera). With that said, the 5DS R delivers the goods where it matters most. All current generation image sensors by far exceed this key requirement. It makes no sense whatsoever to shoot anything at ISO-25000 or ISO-100,000+. I would really like to know who is shooting anything at those ISO levels and for what purposes. In my opinion high ISO capability is about as relevant as lens cap keeper – pointless. The dynamic range observed in practice is much better than I expected. It is indeed better than the 7D Mark II’s sensor however not quite as wide as the 5D Mark III’s dynamic range. Still, very useful without any terrible cut off. I love the synergy and harmony of the ergonomics in the Canon Pro camera line. 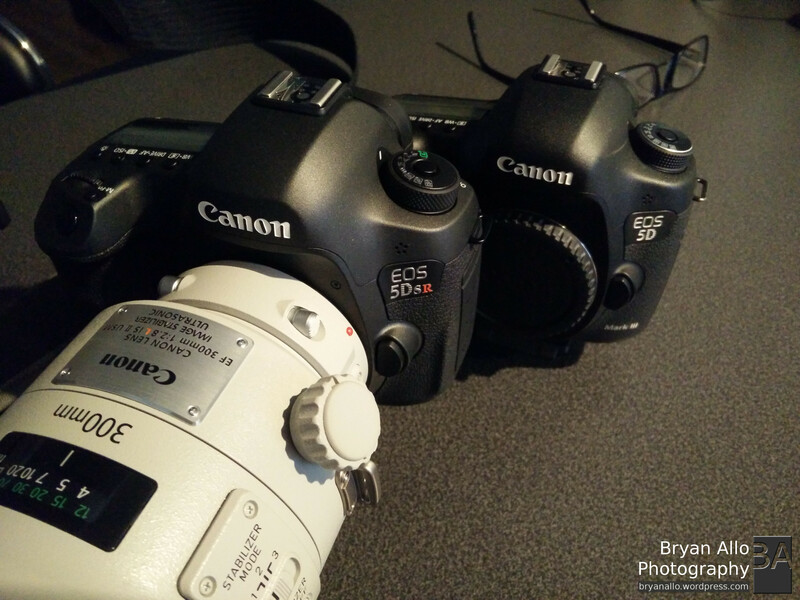 I routinely switch from the 7D Mark II to the 5D Mark III and now the 5DS R seamlessly. This goes back to Canon’s “Photographer First” philosophy I discussed at the beginning of this post. The 5D series finally gets a professional grade AF. Dual DIGIC6 processors is really the only way to go with the pro bodies. This affects every aspect of a camera system. Canon pulled out all stops to make sure once you are ready, nothing gets in the way of you getting your shot. While photographing the model (Shelby) above in near darkness, the 5DS R was able to acquire focus consistently with the EF 300mm f/2.8L IS II at 60 feet away while moving. On time, reliable and accurate AF is a big part of effective photography. Having dual processors is even more indispensable when processing those large 50.6 Megapixel images on the fly. I recommend the fastest possible memory – high speed 1000x 64GB CF cards or more. While it may have a slower shutter, it is effectively pumping out more pixels that the 7D Mark II or 1Dx in full burst mode. Don’t bother with SD cards even the “high speed” ones. They’re ok for backup. Image files are huge. You will need a beefed-up workstation to process the RAW files comfortably. Battery life is acceptable considering how much data the camera has to process with each shot. Because the images are much larger, every action on the camera will use more power. Expect about half the battery life of the 5D Mark III. 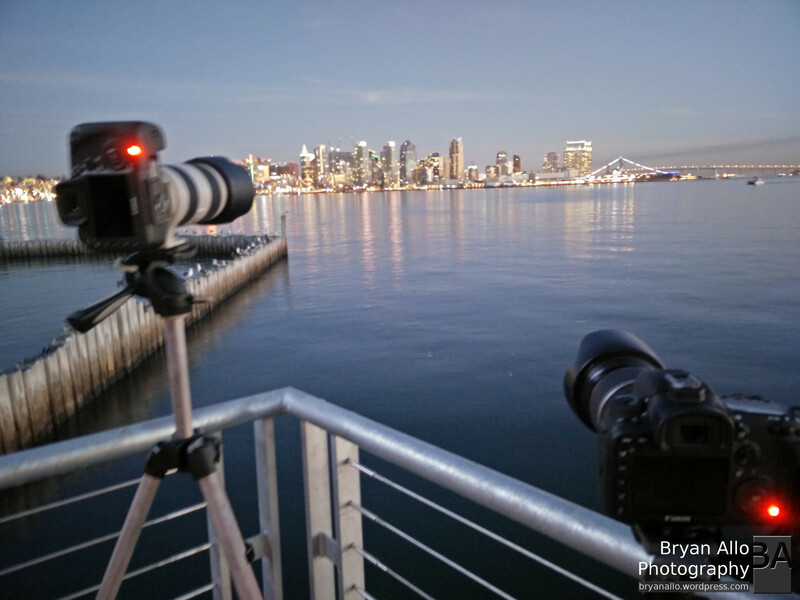 I recently shot all afternoon and evening in San Diego with the 5DS R and one full Canon LP-E6 battery and was left with 1 bar. I took over 1000 shots and minimized use of the display, and other power hungry functions. This is where an optical viewfinder makes all the difference. The 5DS R is ultra high resolution done right. However here are few things I thought would be especially useful to have, ideally in future firmware revisions. Image review default zoom level. Since we are often interested in zooming in when reviewing images, it would be most helpful to be able to set what zoom level the images is shown at (say 0-4) when reviewing images. That way you can just use the joystick to scroll around the image. This feature would be nice to have on 7D Mark II and 5D Mark III as well. Intervalometer exposure ramping. When shooting time lapse of a changing scene like sunrise or sunset, this feature would allow me to tell the camera metering system to never set an exposure higher or lower than the previous shot. This often happens when shooting a time lapse at sunset where subtle changes in the scene cause individual frames to be slightly underexposed relative to the previous one. This introduces flicker in the time lapse which requires complicated linear video filtering using VirtualDub to try and minimize. This feature would be nice to have on 7D Mark II. Thanks for stopping by and reading. I hope you find this post useful. Please feel free to share any feedback, ideas or questions you may have.